a new bohemia: red lipstick. I haven't worn enough red lipstick in recent years. I wore it throughout high school (MAC Russian Red, matte). Then, I put it on the back shelf during college-- favoring a 'natural' look instead. A few years passed, I graduated and moved to San Francisco, began working. I got married and my husband and I played in that glorious city. 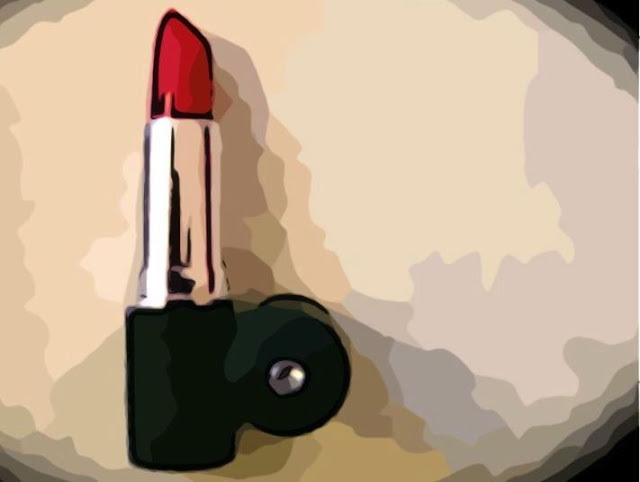 Daytime was full of my college 'natural' while evenings were spent strengthening my palette, dining at some of the cities great restaurants and sipping wine while wearing my red lipstick (MAC Red, satin). Then, I shelved the red during my design school years, favoring instead big bulky 'design school' black framed glasses. Next came Paris. Seven weeks in and I was at the Sephora on the Champs-Elysee, discovering a new red-- that elusive, it only worked in Paris and never again, orangey red (Giorgio Armani #20, matte). Eight weeks in and I was sipping chardonnay and eating foie gras pate, wearing my red lipstick. Then, it was a bitter winter in Philadelphia where I was too cold to even think about anything other than Carmex lip balm. Seattle followed and red appeared on and off throughout the seasons, as appropriate to the occasion (Aveda Cassia 865, glaze). But early morning newborn stroller walks and constant take-out coffee sipping gave way to the ease of glosses. Oh, and being brutally honest, I cheated on red a bit and had a love affair with an ever present purple magenta color. Eventually, Bangkok appeared and the days were filled with thoughts of merely surviving the heat. Huge swipes of glossy color dominated the mornings, but more often than not, red lost the battle quickly in the steamy humidity. Crystal clear glosses took center stage. And, now, I am here. In the middle of a hot summer day, thinking about the possibilities of autumn and warming to the idea of putting some saturated color on my lips in the upcoming months. It's been too long and the time has returned. Hello red. Lovely to see you again. Have you tried The Body Shop's reds? They are natural and glide on really well. By the way, I dream of wearing red lipstick and walking through France! I love your site! I love it! I'm hooked and check it every morning now! You are an inspiration and proof that being a mom and loving your kids CAN coexist with being cool and interested in the world. How you live overseas with three litte kids (and a husband!) is beyond my imagination, but I love dreaming of what my life would look like if I packed my family up and did what you are doing. I'm hoping you write tomorrow! I'll be back with my morning coffee! Ok, I'm going to go get a tube of red lipstick! I remember you wearing red lipstick in high school. I always thought that was cool! Nice blog. Thanks. Now I NEED to go get some red lipstick. I used to wear MAC Russian Red too! I wonder if they still sell it. You have to try MAC's lipglass! The red shades are really pretty and would look great on you! Have you tried any of Chanel's reds? I think you should give us a list of your favorite makeup! I'd love to hear what you use! I love makeup but don't like buying new things if I'm not sure they are good. I remember you always have some fun, new things to try! Love your blog Shelby! Wow, you make me want to break out the red now too. I was BIG on red lips in my early 20s (the early 90's) but now that I'm older I lean toward a mauvey-pink. It's "safe". Might be time to shake things up.